Ferdinand de Saussure | Semantic Web, Artificial Intelligence, and The "Meta" Internet: The genesis of a "virtual" Silicon Valleys leveraging the power of the Internet. 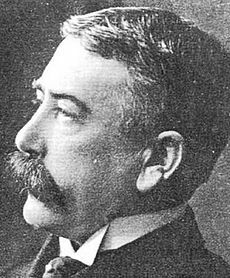 Ferdinand de Saussure (pronounced [fɛʁdinɑ̃ də soˈsyːʁ]) (26 November 1857 – 22 February 1913) was a Swiss linguist whose ideas laid a foundation for many significant developments in linguistics in the 20th century. Saussure is widely considered to be one of the fathers of 20th-century linguistics, and his ideas have had a monumental impact on literary and cultural theory and interpretation. Ferdinand Mongin de Saussure, born in Geneva in 1857, showed early signs of considerable talent and intellectual ability. After a year of studying Latin, Greek, Sanskrit, and a variety of courses at the University of Geneva, he commenced graduate work at the University of Leipzig in 1876. Two years later at 21 years Saussure studied for a year at Berlin, where he wrote his only full-length work, Mémoire sur le système primitif des voyelles dans les langues indo-européenes (Thesis on the Primitive Vowel System in Indo-European Languages). He returned to Leipzig and was awarded his doctorate in 1880. Soon afterwards he relocated to Paris, where he would lecture on ancient and modern languages. He taught in Paris for 11 years before returning to Geneva in 1891. Saussure lectured on Sanskrit and Indo-European at the University of Geneva for the remainder of his life. It was not until 1906 that Saussure began teaching the Course of General Linguistics that would consume the greater part of his attention until his death in 1913. Saussure’s most influential work, Course in General Linguistics (Cours de linguistique générale), was published posthumously in 1916 by former students Charles Bally and Albert Sechehaye on the basis of notes taken from Saussure’s lectures at the University of Geneva. The Course became one of the seminal linguistics works of the 20th century, not primarily for the content (many of the ideas had been anticipated in the works of other 19th century linguists), but rather for the innovative approach that Saussure applied in discussing linguistic phenomena. Its central notion is that language may be analyzed as a formal system of differential elements, apart from the messy dialectics of real-time production and comprehension. Examples of these elements include the notion of the linguistic sign, the signifier, the signified, and the referent. In 1996, a manuscript of Saussure’s was discovered in his house in Geneva. This text was published as Writings in General Linguistics, and offers significant clarifications of the Course. While a student, Saussure published an important work in Indo-European philology that proposed the existence of a class of sounds in Proto-Indo-European called sonant coefficients. The Danish scholar Hermann Möller suggested that these might actually be laryngeal consonants, leading to what is now known as the laryngeal theory. It has been argued that the problem Saussure encountered, of trying to explain how he was able to make systematic and predictive hypotheses from known linguistic data to unknown linguistic data, stimulated his development of structuralism. Saussure’s predictions about the existence of sonant coefficients/laryngeals and their evolution proved a resounding success when the Hittite texts were discovered and deciphered, some 20 years later. The impact of Saussure’s ideas on the development of linguistic theory in the first half of the 20th century cannot be overstated. Two currents of thought emerged independently of each other, one in Europe, the other in America. The results of each incorporated the basic notions of Saussurian thought in forming the central tenets of structural linguistics. In Europe, the most important work was being done by the Prague School. Most notably, Nikolay Trubetzkoy and Roman Jakobson headed the efforts of the Prague School in setting the course of phonological theory in the decades following 1940. Jakobson’s universalizing structural-functional theory of phonology, based on a markedness hierarchy of distinctive features, was the first successful solution of a plane of linguistic analysis according to the Saussurean hypotheses. Elsewhere, Louis Hjelmslev and the Copenhagen School proposed new interpretations of linguistics from structuralist theoretical frameworks. In America, Saussure’s ideas informed the distributionalism of Leonard Bloomfield and the post-Bloomfieldian Structuralism of those scholars guided by and furthering the practices established in Bloomfield’s investigations and analyses of language, such as Eugene Nida, Bernard Bloch, George L. Trager, Rulon S. Wells III, Charles Hockett, and through Zellig Harris, the young Noam Chomsky. In addition to Chomsky’s theory of Transformational grammar, other contemporary developments of structuralism include Kenneth Pike’s theory of tagmemics, Sidney Lamb’s theory of stratificational grammar, and Michael Silverstein‘s work. Outside linguistics, the principles and methods employed by structuralism were soon adopted by scholars and literary critics, such as Roland Barthes, Jacques Lacan, and Claude Lévi-Strauss, and implemented in their areas of study (literary studies/philosophy, psychoanalysis, and anthropology respectively). However, their expansive interpretations of Saussure’s theories, which contained ambiguities to begin with, and their application of those theories to non-linguistic fields of study such as sociology or anthropology, led to theoretical difficulties and proclamations of the end of structuralism in those disciplines. Ferdinand de Saussure was the subject of a song by indie pop band The Magnetic Fields. Saussure, Ferdinand de. (2002) Écrits de linguistique générale (edition prepared by Simon Bouquet and Rudolf Engler), Paris: Gallimard. ISBN 2-07-076116-9. English translation: Writings in General Linguistics, Oxford: Oxford University Press. (2006) ISBN 0-19-926144-X. This volume is based on the manuscript of Saussure’s “book on general linguistics”, found in 1996 in Geneva. Saussure often mentioned the existence of such a manuscript, but it was thought to have been lost for a long time. With this new textual source, new light is shed on the work of Saussure. In particular, new elements appear that call for a revision of the legacy of Saussure, and call into question the reconstruction of his thought by his students in the Course in General Linguistics (1916). (1878) Mémoire sur le système primitif des voyelles dans les langues indo-européenes (Memoir on the Primitive System of Vowels in Indo-European Languages), Leipzig: Teubner. (online version in Gallica Program, Bibliothèque nationale de France). (1916) Cours de linguistique générale, ed. C. Bally and A. Sechehaye, with the collaboration of A. Riedlinger, Lausanne and Paris: Payot; trans. W. Baskin, Course in General Linguistics, Glasgow: Fontana/Collins, 1977. (1993) Saussure’s Third Course of Lectures in General Linguistics (1910–1911): Emile Constantin ders notlarından, Language and Communication series, volume. 12, trans. and ed. E. Komatsu and R. Harris, Oxford: Pergamon. ^ Justin Wintle, Makers of modern culture, Routledge, 2002, p. 467. ^ David Lodge, Nigel Wood, Modern Criticism and Theory: A Reader, Pearson Education, 2008, p. 42. Culler, J. (1976). Saussure. Glasgow: Fontana/Collins. Ducrot, O. and Todorov, T. (1981). Encyclopedic Dictionary of the Sciences of Language, trans. C. Porter. Oxford: Blackwell. Harris, R. (1987). Reading Saussure. London: Duckworth. Holdcroft, D. (1991). Saussure: Signs, System, and Arbitrariness. Cambridge University Press. Lyons, J. (1968). An Introduction to Theoretical Linguistics. Cambridge University Press. Sanders, C., ed.(2004). The Cambridge Companion to Saussure. Cambridge University Press. ISBN 0-521-80486-8. Wittmann, Henri (1974). “New tools for the study of Saussure’s contribution to linguistic thought.” Historiographia Linguistica 1.255-64. Original texts and resources, published by Texto, ISSN 1773-0120 (French). Hearing Heidegger and Saussure by Elmer G. Wiens.